Grammy-Award winning Bronx drummer Will Calhoun speaks at the unveiling of the Boogie Down Booth. SOUTH BRONX — It's a high note for this Bronx subway station. 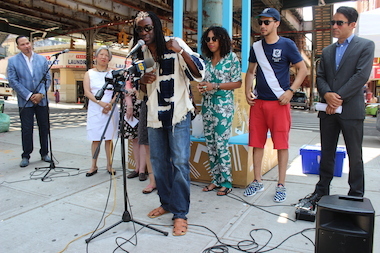 The city's Department of Transportation and the Design Trust for Public Space unveiled on Wednesday a temporary seating area beneath the Freeman Street subway stop that plays music around the clock from local artists. The space at Freeman Street and Southern Boulevard on the 2 and 5 lines, dubbed “The Boogie Down Booth,” is part of a Design Trust initiative called "Under the Elevated," which aims to increase the functionality of city spaces beneath bridges and elevated highway, subway and rail lines. The booth beneath Freeman Street includes solar powered lights and is meant to make the area more hospitable, giving people a chance to sit while they wait for a bus and learn about music from the borough. The music is supposed to help counteract the sounds of traffic and the subway as well. Elena Martinez, co-artistic director of the Women's Housing and Economic Development Corporation's Bronx Music Heritage Center, which helped put together the project and curate the playlist, said she hoped it would help people realize that there is more to the borough than a slew of negative stereotypes. “One of the missions, out of all the work that we do, is definitely to highlight the positive,” she said. The booth plays 18 songs right now, including “Viva México” by the Mariachi Academy of New York, “Love for Sale” by Grammy-Award winning Bronx drummer Will Calhoun and “All We Need” by local hip-hop group Circa ’95, who performed at the ceremony as well. Calhoun said in his remarks at the unveiling that he has worked with musicians in Africa, Europe and South America, and his experiences in the Bronx helped get him ready for his travels. “This community, this borough, the music of this borough, prepared me for the world,” said Calhoun. The city's department of Small Business Services helped support the booth through a Neighborhood Challenge grant, and Sumaila Palla, director of the agency's citywide storefront improvement program, was happy with the way it turned out. The booth brings life to an inactive space, and the music is quiet enough so that people who do not want to hear it will not be disturbed, she said. "I didn't realize there was any music playing until I sat down there," she said. The installation will be in place through Monday, Sept. 15 and is the second prototype for Under the Elevated, following the June 20 unveiling of an interactive community calendar in Manhattan on Division Street under the Manhattan Bridge. Temporary installations like these are meant to pave the way for broader environmental changes around the city's transportation infrastructure, which Design Trust Executive Director Susan Chin described as space the city cannot afford to waste. She was thrilled with the way the booth came out. “Celebrating Bronx music, I mean, how great is that?” she asked. Sheneek Thompson, who lives nearby, was happy with the booth as well, describing it as a good place to sit down while waiting for the bus. She said they should install similar booths throughout the Bronx and only had one critique: she couldn't select the music herself. "It'd be better if you could control it," she said, "but, you know."